Produced by Jake Palumbo Written by T. Vick & C. Blue Engineered by Mo Kofuma Mixed by Jake Palumbo Urban Dictionary defines the phrase "Tuff" as -“ Cool, in a rugged wrong-side-of-the-tracks way." 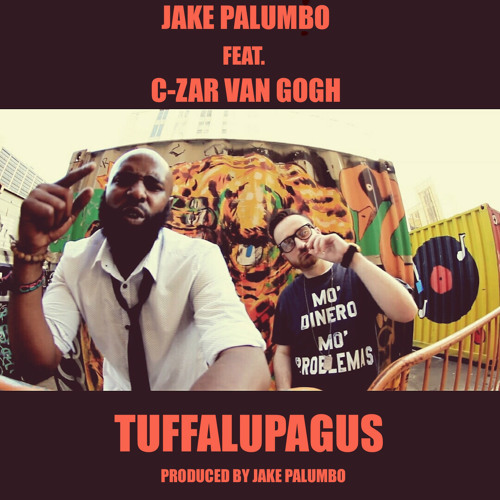 Jake Palumbo - the Brooklyn-by-way-of-Tennessee Producer, Engineer & Emcee (whose credits include Shabaam Sahdeeq, Ras Kass, El Da Sensei, Royce Da 5’9” & many more) - teams up with his SpaceLAB label-mate C-Zar Van Gogh over a reggae-tinged instrumental, seeking to establish a new entry in the SpaceLAB Slang Dictionary - #Tuffalupagus, which can essentially be interpreted as meaning "Tuff...times infinity." “Smoking on the finest / Focused On The Commas / Poking On A Dime / If You Don’t Know What To Call It? - Tuffalupagus.” Need to buy a soda but can’t, only having $100 bills at your disposal? It’s Tuffalupagus.While “Tuffalupagus” can be considered a “leak” & not a first single, it will be included on his 4th solo LP “Jake It Till You Make It”, which will hit retailers fall 2015 on SpaceLAB Recordings. SpaceLAB’s expansive discography (Over 36 titles - LP’s, EP’s, mix tapes, singles & collaboration projects - some available for free download) can be found on their Bandcamp store at http://spacelabrecordings.bandcamp.com All DJ’s who would like to receive Main/Clean/Instrumental/Acapella mixes sent to their email please email us at spacelabrecordings@gmail.com, & let us know if you’d like to be added to our future DJ pool mailing lists.